Ball, butterfly and plug valve kits. 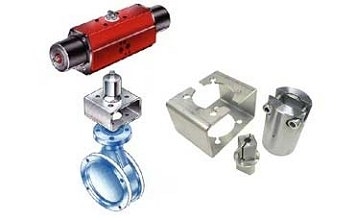 A complete range of precision CNC machined stainless steel or carbon steel mounting kits. With open or closed construction, mounting kits are engineered from certified material, individually bagged and labelled ready for assembly. Quarter-turn valve adaption for rack and pinion or pneumatic actuators can be provided in the form of spool or pedestal type mounting kits. These are fully enclosed carbon steel adaptors with options DD, square or keyed drives.